Senegal is a small country with a total land area of about 196 722 square kilometres. It is part of a climatic zone characterized by a weak and random rainfall with severe and extended cyclical droughts (1982 and 1984), on one hand, and the predominance of arid and fragile lands conducive to the erosion of natural resources, on the other. The overall level of development in Senegal has declined to a relatively low per capita income of only US$453 in 2000, down from US$716 in 1975, US$676 in 1990 and US$545 in 1996-1998. The country has also performed poorly in building its capacity in the areas of health, nutrition and education. The country ranked 153rd out of 174 according to the 2000 United Nations Human Development Report (Jeune Afrique, 1999, 2000). Senegal is now recognized (December 2000) as the 49th LDC eligible for LDC status (GOS, 2001). Senegal is relatively one of the most highly indebted countries in the world with a stock of debt amounting to SDR2 665 million and and related service (after rescheduling) of SDR78.8 million in 2000 (IMF, 2001). The Government expects to finalize its poverty reduction strategy paper in 2002 and hopes to obtain a favourable review of this paper. This outcome will enable the country to reach the completion point under the enhanced HIPC initiative in 2002. For the time being, Senegal has received HIPC interim relief from the World Bank, the IMF and the African Development Bank. The Paris Club agreed to provide relief in October 2000, and Senegal signed agreements with Norway, Spain and the United States by the end of July 2001. The country has maintained a high interest in the debt talks with the rest of the creditors of the Paris Club with the hope of gaining further debt relief as well. The primary sector of Senegal accounts for about 20 percent of economic output in recent years, of which agriculture contributes about 10 percent. The sector provides subsistence and cash income for about two-thirds of its 9.7 million inhabitants, of which 75 percent are undernourished. Agricultural products account for 20 percent of Senegals total merchandise exports, while food imports absorb 29 percent of total foreign exchange earnings. Agricultural exports are dominated (by more than 50 percent) by groundnut products, followed by cotton, fruit and vegetables, and hides and skins. Senegal is presently dependent for its food supplies on the world market particularly in rice, which represents almost 75 percent of total cereal imports. Senegal began its first round of trade and related reform measures in the mid-1980s. Prior to 1986, there were essentially two duties, a customs duty and a fiscal duty. The former was a uniform rate of 10 percent. Fiscal duties varied between 0 and 75 percent. The government attempted in 1986-1988 to simplify the tariff structure by reducing to four the number of product categories while reducing the overall level of tariffs and non-tariff barriers to trade (import licensing, reference values, import bans, import monopolies covering sugar, rice and cement; World Bank, 1993). By 1988, the maximum tariffs were reduced and many exemptions removed. The range of tariffs narrowed from 0-190 percent to 0-128 percent. These reform measures resulted in a reduction in the average effective protection rate from 165 percent in 1985 to 89 percent in 1988 (UNDP/World Bank, 1993). Owing to a reduction in revenues and domestic opposition to the measures, some reversals occurred. In August 1989, customs duties were raised from 10 percent to 15 percent. A stamp duty of 3 percent was introduced in 1990. As a result, the average statutory rate of import taxes (combining customs and other taxes), which had been reduced from 98 percent in 1986 to 68 percent in 1988, rose again to 90 percent in 1991 (UNDP/World Bank, 1992). Prior to the second-generation reforms of the 1990s, there was also significant use of NTBs. In 1985, 160 categories of goods were covered by QRs (UNDP/World Bank, 1993). By February 1988, QRs had been almost completely removed. However, this was largely offset by the introduction in late 1988 of reference prices, which effectively protected many domestic industries and in some cases were even set at prohibitive rates. In addition, together with the tariff reform reversal in 1989, the government reintroduced some of the previously abolished or new QRs, and specific minimum rates of import duties were introduced. Senegal embarked upon a more stringent set of policy measures including the New Industrial Policy and the New Agricultural Policy in the mid-1980s well before the conclusion of the Marrakesh Agreement in 1994. However, the reform process failed to produce the expected outcomes in the early 1990s. Senegal remained one of the worlds net food-importing countries constantly shocked by various external and local uncertainties. In June 1994, the Government published a new policy paper for agricultural development, which was further revised in April 1995. This paper set out the framework and goals for Senegals agriculture in relation to the macroeconomic strategy proposed in the context of the 1994 CFAF devaluation. This strategic paper provided the foundation of the reform package known as the Agricultural Structural Adjustment Program supported by the Credit for Adjusting the Agricultural Sector (CASA), which was carried out during 1993-1997 with the support of several donors including the World Bank, the French Agency for Development, the EU and USAID. Other recent policy statements have included the Agricultural Development Policy Paper adopted in 1995 and the Agricultural Institutional Reform Paper adopted in October 1998. The main thrust of the mid-1990s measures was to strengthen the commpetitveness of various sectors while alleviating the problems that arose in the aftermath of the 1994 CFA franc devaluation, as well as providing support to reforms engaged already with donors (MEFP, 1996). The second set of actions encouraged price liberalization, institutional reforms, structural restructuring of selected industries (privatization, etc.) to ensure more efficiency in sectors such as rice, cotton, groundnuts and livestock. The reforms also placed emphasis on a greater participation of farmer groups and the private sector in activities carried out until now by public sector parastatals. Senegal is the second largest member of the WAEMU, accounting for about 17 percent of the Unions economic activity. It embarked upon a reform scheme in 1994, including a 50 percent devaluation of its currency with respect to that of France in compliance with the terms of this membership and with the goal of restoring the declining competitiveness of its economy. As a result, its tradeweighted real effective exchange rate declined by about 30 percent. Subsequently, price controls were progressively lifted, and the number of items requiring import authorization was reduced. This latter practice was discontinued altogether by the end of 1995 to comply with the terms of the membership of the WTO, of which Senegal became a contracting party in 1995. Senegal has been a signatory to the Lomé Convention and, more recently, the Cotonou Agreement in 2000, which envisages an Economic Partnership Agreement between the EU and its ACP partners. The protocol is scheduled to last for a period of 20 years (2000-2020) with the possibility of a mid-term review. Under the Cotonou Agreement, the EU will maintain the terms of its current non-reciprocal preferential trade arrangements up to December 2007. The Accord will then be transformed into a series of reciprocal free trade arrangements. Senegal is preparing to engage in talks with the EU with a view to benefiting effectively from the trading opportunities announced in March 2001 under the EUs Everything but Arms (EBA) initiative for the LDCs. Senegal has recently agreed to mandate the Commission of WAEMU (hereafter the Union) to engage in future negotiations on its behalf in the forthcoming round of EU/ACP talks, which began in September 2002. Before independence, Senegal participated in GATT in its capacity as a French overseas territory. In 1963, it became a contracting party in its own right with its tariff schedules maintained as those originally granted by France before independence (WTO, 1994). About 29 percent of agricultural tariff lines were bound in these schedules. During the UR negotiations, these tariff concessions were renegotiated, and Senegal bound 100 percent of its tariff lines in agriculture at a relatively high and uniform rate and made no reduction commitment (Table 1). Source: WTO Schedule and Statistiques Douanières, Direction Générale des Douanes Sénégalaises. The bindings consist of a customs duty of 30 percent and ODCs of 150 percent. The use of ODCs, which is more frequent in Africa, has been questioned by Senegals trading partners during the verification process. Examples of ODCs on imports include, among others, a maritime tax, a supplementary tax (which is intended to approximate the value-added tax applicable on importers profit margins) and product-specific excise taxes (e.g. on stimulants such as coffee, tea and tobacco). Applied tariffs are much lower than bound tariffs, ranging from 27 percent to 65 percent (Table 1), leaving considerable margin for discretionary increases in applied rates. This large gap between bound and applied rates is explained by the fact that, under the agreed structural adjustment programmes, Senegal committed to setting low tariffs and eliminating various non-tariff barriers. In fact, tariff reductions and reorganization of the import regime took place much before the conclusion of the UR in 1994. Unlike bound rates, applied rates vary, with relatively high tariffs for products like fruit and vegetables, cotton and textile fibres, and sugar. For several products considered sensitive, surtaxes were introduced during the UR in replacement of the earlier import quotas. The surtax is 20 percent for rice, bananas, onions and potatoes and 10 percent for imported millet, sorghum and corn. Since it opted for the ceiling binding approach in the UR, Senegal is not entitled to resort to the SSG provisions of the AoA. It has no specific safeguard provisions, anti-dumping or countervailing duty legislation. The application of reference import prices (valeurs mercuriales) which may have served a similar purpose has been discontinued. In general, its market access commitments do not seem to impose any real constraint on Senegals border policy. The bound rates have been set at levels high enough to provide some effective protection against import-competing products whenever necessary. Actual border policies are determined more by the domestic SAPs agreed upon in the mid-1980s and the regional trading agreements (RTAs) in which Senegal has been involved since the 1990s. Under SAPs, the bulk of non-tariff barriers existing before 1995 have been abolished, and import tariffs and duties have been considerably lowered (Dean et al., 1994). Being a signatory to a number of RTAs, Senegal has recently implemented a series of changes in trade policy (as discussed earlier) to comply with these agreements. The most significant of these was the far-reaching reduction in border tariffs resulting from the application of the CET of the WAEMU in January 2000. Under the CET, Senegal lowered its top rate, setting its tariff for four product categories with custom rates of 0, 5, 10 and 20 percent (Table). Most of the agricultural products fall within categories III and IV with CET of 10 and 20 percent, respectively. Category I: Essential social products: pharmaceutical products, books, newspapers, etc. Category II: Basic consumption products: raw materials, equipment and specific inputs, etc. Category III: Intermediate consumption products and inputs. Source: Ministry of Economy, Finance and Planning of Senegal. To conform with the CET, surtaxes were eliminated, except for millet, onions, potatoes, sorghum, banana, maize, cigarettes, rice, and oil products until the effective implementation of the TCI. Obviously, these commitments are much more restrictive than those made under the AoA. They have provoked a wideranging debate on their possible implications for the Senegalese economy. Concerns were expressed on their possible negative effects on fiscal revenue and agricultural producers. The benefits from RTAs were seen to originate mainly from exports of industrial products to its regional trading partners. The country has commissioned studies to reach conclusions on the subject in a near future. The Union Solidarity Tax of 1 percent, which is applied on consumption products. The Statistical Tax of 1 percent, which is levied on the customs value of merchandise, applied to all goods. The Regressive Protection Tax (TDP), which is intended to temporarily compensate for the decline in tariff protection of the Union enterprises following the implementation of the CET. This tax will be implemented for four years only starting in July 1999 with two levels of protection (10 percent and 20 percent). Senegal has adopted the 10 percent rate. The Import Tax (TCI) to compensate for losses owing to world price fluctuations or unfair practices (dumping, subsidies). It is applicable to bovine meat, poultry meat, concentrated milk, potatoes, onions, bananas, corn, rice, sorghum, millet, wheat flour, refined vegetable oils, sugar, concentrated tomato and cigarettes based upon a trigger price system adjustable every six months as needed. As of March 2002, sugar is the only sector to benefit from this instrument. However, steps are under way to expand the scope of the TCI to other sectors in difficulties (rice, onions, potatoes, wheat flour, etc.). The Reference Value System determines customs value in order to prevent tax evasion and to combat unfair competition. TDP cannot be used simultaneously with the reference value system. This scheme has been challenged within the WTO trade policy review process and is no more in force. These last two instruments may serve as safeguard measures in replacement of the former reference import price system. Having declared an AMS of zero for the reference period 1986-1988, Senegal has no reduction commitment to fulfil. Measures exempted from reduction (Green Box and SDT) are shown in Table 3, where it can be seen that the total outlay on such measures was CFAF36 billion (about US$60 million), of which over 85 percent was for investment in water development. Source: Senegals WTO Schedule. aCFAF600 = US$1.00. Support for agriculture has been wound down since 1995. The fertilizer subsidy has been removed, and the fertilizer market is now in the hands of SENCHIM, a private company. Government credit for seeds has also been stopped. Producers are increasingly responsible for the debts incurred with the farm credit agency (Caisse Nationale de Crédit Agricole). The Government is also pulling out of strategic sectors such as groundnuts, with the imminent privatization of SONACOS, the groundnut-processing factory and the closing down of SONAGRAINES. Its role is now limited to maintaining a strategic stock of seed and grains within the framework of an ambitious agricultural programme. Senegal has not notified any domestic support measures since 1995. Because of this and because of the lack of detailed information on the level of support actually provided to agriculture, it is difficult to assess the situation regarding its compliance with the relevant AoA provisions. A number of weaknesses remain and must be removed if the National Committee for Trade and Multilateral Negotiations is to participate effectively in the preparation of future WTO negotiations. Technical assistance and financial support are needed in this regard to adequately strengthen its capacity. Presently, the Committee has not been able to deliver all the information required to feed the ongoing WTO trade review process. Regarding the trade-distorting (Amber Box) measures, as a developing country, Senegal can grant subsidies to farmers, under the WTO de minimis provision, up to 10 percent of the value of production of particular crops and up to 10 percent of the total value of agricultural production in the case of non-product-specific support measures, e.g. for inputs like fertilizers and agricultural equipments. Consequently, there seems to be substantial scope for such subsidization. With the total value of agricultural production of approximately US$860 million, nonproduct- specific subsidies are permissible up to US$86 million. Moreover, many of the non-product-specific subsidies can be transferred to the SDT category, if they are directed to low-income and resource-poor farmers. As for the non-trade-distorting (Green Box) measures, there is no limit to the support that can be accorded. Indeed, most of the support measures adopted in accordance with the current strategy for agriculture fall into this category. In addition, Senegal has considerable flexibility to support agriculture through measures under SDT. In view of the financial constraints, however, support through Green Box and SDT measures is likely to remain limited for the time being. On the whole, complying with the AoA rules on domestic support measures has not been an issue of concern in Senegal so far. In view of the longer-term implications of WTO commitments, it would be prudent to develop a view of how the AoA disciplines might constrain in any way the future implementation of agricultural development policy. To that end, it would be necessary to undertake an in-depth analysis of the situation by computing the threshold levels under various forms of support measures. The important first step is to compute all these support measures, categorize them under the various AoA boxes and report to the WTO. This work has not yet been done because of various constraints including the lack of adequate human resources and technical support to facilitate the interactive process between Senegal NCTMN and the WTO Special Committee on Agriculture. Senegal has not notified any export subsidies either in the base period or in subsequent years, and hence it is not entitled to provide non-exempt export subsidies in the future. In fact, traditional exports have often been taxed in the past. For example, prior to 1984, a 20 percent tax was applied on groundnuts and groundnut oil. In 1984, taxes were abolished on exports to increase producer revenues as well as to ensure competitiveness in world markets. Prior to the UR, export subsidies were provided for only a few products, mainly processed goods, with rates varying from 5 percent for fruit and vegetables to 59 percent for cattle fodder. Although they were terminated before the UR was completed, they point to the type of products that the Government might be interested in supporting through WTO-compatible subsidies, if it had sufficient financial resources. By virtue of its developing country status, Senegal is entitled to grant subsidies to reduce the cost of domestic marketing and international freight, an exemption that could be important in view of the countrys high transport costs, particularly for fruit and vegetables. Unfortunately, the implementation of structural adjustment measures during the 1995-2000 period did not allow any room for such support. As a result, many Senegalese exporters have seen their competitive position eroded without getting any relief measures from the government, especially in the fruit and vegetable sectors. There have been a number of other incentive measures aimed at promoting exports, such as drawback facilities for custom duties, export finance, and export insurance and guarantees. In the context of ongoing structural adjustment measures in force in the country, most of these instruments have remained inactive. The newly agreed EU/ACP Cotonou Agreement aims to improve EU market access conditions by incorporating into the EU concessions an additional number of agricultural tariff schedules of interest to ACP countries including Senegal and excluded until now from previous ACP/EU trade agreements. The agreement maintains the actual levels of preferences as regards products of Senegalese origin up to 31 December 2007. The AoA has had limited impacts on the expansion of Senegal exports to the EU market because of the trade facilitations that existed long before the conclusion of the accord and the increased competition in the EU market arising from similar advantages being increasingly granted to selected other developing or least developed countries (Brazil, Malaysia, etc.) under various new initiatives including the EU Everything But Arms initiative of March 2001. With the passing of the URA as regards SPS, TBT and TRIPS Senegals domestic policies will have to be modified in several specific areas to comply. In the short run, the effects of these rules have been felt very much in the countrys export activities. Senegal must meet the constantly changing EU food regulations of relevance to its export base, which includes groundnut products, fish products, cotton and especially fruits and vegetables. For example, SONACOS, the countrys largest groundnuts exporter, has made the necessary investments to match the requirements of the EU food market in response to several directives including EU Directive no. 1525/98 and related new accompanying measures, which have been used to set aflatoxin-related residue limits for some food products including groundnuts. The same ruling has reduced the number of ports of entry for Senegalese groundnut products to only two cities (Marseille, Le Havre) since January 2000, thereby reducing the flexibility of the countrys exporters. In the cotton sector, SODEFITEX has improved several aspects of its production operations resulting in a higher cotton quality (SODEFITEX, 2001). Concerns over the same issues have led to at least CFAF20 billion in investments in support of upgrading capacities and infrastructures in the fishery sector as well as the fruit and vegetable sector. Thus, a new freight station will be opened up in the near future to serve the Leopold Senghor International Airport. The move should improve conservation, conditioning and the shipping conditions of perishable export items such as fruits, vegetable, fish and flowers. There is ongoing effort in Senegal to support the operations of various specialized laboratories to deliver specific services covering all aspects of food quality and safety (management and control instruments, quality insurance, conformity, corporate certification). These activities are the responsibility of institutions operating in the public as well as the private sector such as the Directorate of Plant Protection of the Ministry of Agriculture and Livestock, and the Cerex/Locutox laboratory, which is responsible for providing SPS services and controlling the maximum limit of permitted residues. The work of these agencies is supplemented by several other domestic and foreign services provided on demand by independent firms such as Société Générale de Surveillance, Veritas, as well as those certified for Best Laboratory Practices locally and abroad. There is no indication that the technical and financial pressures for further SPS/TBT related upgrading and investments will diminish soon. Before independence, the technology and regulatory regime in force in Senegal was administered under the authority of the French National Institute for Industrial Property Rights. In 1962, Senegal became a contracting party in its own right to the Agreement of Libreville (AoL) establishing the Office Africain et Malgache de la Propriété Industrielle (OAMPI), a regional organization among 12 countries from Africa and Madagascar. OAMPI has acted on behalf of its member states in three areas, including legislation covering the development of technology in their region. AoL was revised in 1977 creating the Agreement of Bangui, which established the African Organization for Industrial Property (AOIP). Its membership includes 16 African countries with a market size of about 100 million inhabitants. In Senegal, monitoring of the activities of AOIP is the responsibility of the Senegal Ministry of Industry, with daily management resting with the Service de la Technologies et de la Propriété Industrielle (STPI). Furthermore, the Government has moved to strengthen its institutional capacity with the creation of the Senegalese Association for Normalization (SAN) in January 2002. Owing to public resource constraints, STPI and SAN have not been very effective in initiating new activities or executing their missions. Similar difficulties face the NCTMN, which comprises various subcommittees including one to follow up on all TRIPS-related issues. Senegals current legislation does not address adequately all the new issues involved in the pursuit of WTO compliance activities, especially the plant varieties protection aspect of TRIPS. However, there have been some positive impacts. One of the immediate benefits may be the increase in awareness of these issues. Two TRIPS-related Acts have been drafted since 1999 and scheduled for parliamentary discussion in the areas of common law (droits communs), neighbour rights (droits voisins) and intellectual property rights (droits dauteurs). The passing of these Acts should reduce the limitations of the law in the post-WTO era. There is still a long way to go before LDCs such as Senegal succeed in archiving and protecting adequately under some sui generis protection approach many of their domestic resources as they re-value their stock of knowledge (traditional medicines, plants), know-how, customs and intellectual productions (folklore, culture, arts). Senegal has not significantly diversified the destination of its trade flows during the last ten years. The trade performance of the country has been dominated by imports and exports with the industrial countries of the north, especially the member countries of the EU. Senegals share of imports from the EU (1993-1994: 51 percent; 1996-2000: 53 percent) is higher than the EUs share of its exports (1993-1994: 44 percent; 1996-2000: 43 percent). The EU appears very much closed to products of Senegalese origin despite the apparent low levels of tariffs facing African products at the borders of the EU, the United States and Japan (Harrold, 1995). 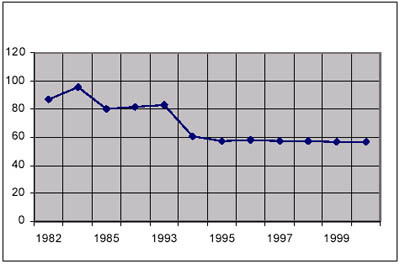 The Lomé Convention of 1995-2000 nor the AoA as implemented during the same period made little difference to these figures. The country has not been successful in exporting more of its products to the United States market, which accounts for less than 1 percent of its exports in 2000 despite the depreciating trend of the CFA franc against the dollar, which has gained 40 percent in value between 1995 and 2000. There is a good chance that these disappointing numbers may be changed in the near future. Senegal is eligible for the US African Growth and Opportunity Act and the EU Everything but Arms initiative. It is worth noting also that Senegal has not registered any significant improvement in its trade numbers with the member countries of WAEMU either. Agricultural exports accounts for about one-fifth of total exports and consist predominantly of groundnut products (oil of groundnuts, cake of groundnuts, shelled groundnuts; 62 percent of the value of total agricultural exports in 1999). Over time, this dominance has been reduced in favour of other products or groups of products such as cotton (44 percent in 2000), fruits and vegetables (12 percent in 2000) and hides and skins (5 percent in 2000). Agricultural exports have fluctuated sharply over the period 1985-2000. The sharp fall since 1990 has been only partially reversed by the effect of the 1994 devaluation (Table 4). The value of agricultural exports has risen 44 percent in recent years to US$150 million (2000) compared with the value registered in the initial year 1985 (US$103 million) (Figures 1 and 2). However, their average value in 1995-2000 (US$107 million) was 23 percent lower than in 1985-1994 and 25 percent lower than the extrapolated trend value (Table 4). Figure 1. Senegal: Agricultural exports (US$ million), 1985-2000. Figure 2. 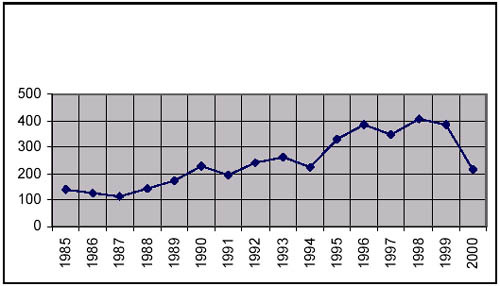 Senegal: Net agricultural imports (US$ million), 1985-2000.
a Extrapolated value based on the 1985-1994 trend. b Numbers in parentheses are percentage changes over (A) and (C), respectively. Source: Computed from FAOSTAT data. Agriculture excludes fishery and forestry products. Because of the predominance of groundnut products, it is informative to examine the trend of agricultural exports when groundnuts are excluded. On that basis, exports are seen to rise somewhat more, increasing from US$38 million in 1985 to US$90 million in 2000. Non-groundnut exports failed to show any buoyancy between 1985 and 1999, fluctuating around US$50 million annually. However, there was a significant increase in 2000 to US$90 million. This jump was due to the increase in the export earnings of cotton products, fruits and vegetables and hides and skins in 2000. For this reason, the average value of non-groundnut product exports in 1995-2000 (US$57 million) was 55 percent higher than in 1985-1994. Thus, the decrease in total agricultural exports during 1995-2000 was mainly due to the poor export performance experienced in the groundnut sector (Table 5). The agricultural trade deficit, as measured by the difference between exports and imports, was accentuated in 1995-2000 - rising by 86 percent to US$345 million compared with 1990-1994 (exports are only 23 percent of imports). This pattern has become one of the permanent features of the Senegal economy with negative effects on the rest of its macroeconomic fundamentals. A closer look at the structural trade numbers suggests that imports are the most dynamic component. From 1985 to 1994, total agricultural imports, which account for 25 percent of total merchandise imports, rose from US$244 million to US$352 million with regular fluctuations. The upward trend continued in subsequent years. As a result, the average value of imports in 1995-2000 (US$454 million) was 40 percent higher than in 1990-1994 although slightly lower than the extrapolated trend value. As for the average value of net agricultural imports, it was 86 percent higher in the post-UR era than in 1990-1994 and 11 percent higher than the extrapolated trend level (Table 4). The rest of this section reviews the numbers as well as developments in the major export and import commodities. Groundnut products are the backbone of the Senegalese agricultural economy. They accounted for some 75 percent of total agricultural exports in 1985-2000, 85 percent of which was constituted by groundnut oil. Export performance has been poor. This sector was very dynamic during the 1960s but encountered difficulties in the mid-1970s with the emergence of several competitive vegetable oils (soybean oil, palm oil, coconut oil, corn oil, sunflower oils, etc.) and the decline in demand for groundnut oil (only 1 percent of world oil market share in 1999-2000: 50 million tonnes). The crisis was intensified at the beginning of the 1990s with the privatization occurring in the sector under the New Agricultural Policy and the elimination of the import ban on groundnut oil in 1998. The situation of the groundnut sector has worsened further with the continued collapse of vegetable oil prices in world markets since 1998 contributing to increasing financial difficulties for SONACOS, the largest state groundnuts processor in the country. The cumulative deficit of this company amounted to about CFAF11 billion for 1998-2000. The situation has become unbearable for the financial health of the State coffers, resulting in a decision in November 2001 to privatize SONACOS by March 2003 and to close down SONAGRAINES in early December 2001, one of its affiliates in charge of transport, marketing and distribution of agricultural inputs in the sector, and to shift greater responsibilities to the private sector (producer associations, industry council, processors) in the future. There is also increased competition in the industry with the entry of NOVASEN, a new private company involved in all activities of the business, from the supply of seeds to the export of the final product. a Extrapolated value based on 1985-1994 trend. b 1995-1999 for groundnut products, cotton lint. One consequence of the difficulties just mentioned has been reduced groundnut production. At present, output is well below capacity, estimated at 920 000 tonnes, with high costs of production. During 1985-1998, the increase in output of groundnuts was mainly due to cultivated area rather than higher yields. On the contrary, yields fell mainly because of the utilization of low-quality seeds. Factors such as those associated with the climate, the diminution of soil fertility and unattractive producer prices also contributed. In 1995, it was decided that the Groundnut National Council (CNIA) would fix the producer price, a measure not enforced until the 2001/2002 crop season. Groundnut exports declined in parallel with production. The average value of exports declined from 34 percent of total agricultural exports in the 1980s to 18 percent in the 1990s. In addition, export performance depends heavily on the behaviour of world prices. The increase in export earnings in 1985-1990 was mainly due to favourable world prices, while the collapse of prices in 1990-1993 resulted in a fall in earnings. In 1994, exports benefited both from a recovery in world prices and devaluation of the CFA franc, which tripled their volume and led to an improvement in the financial situation of SONACOS. However, although the improvement in world prices has been sustained, Senegal failed to improve its share in the world groundnut market because of strong competition from vegetable oils whose prices command major discounts relative to that of groundnut oil. The impact of this fierce competition has been felt in the external trade figures as well as domestically in the context of the implementation of the AoA. The average value of exports of groundnut oil in 1995-1999 (US$46 million) was 33 percent lower than in 1990-1994 and equally below the extrapolated trend value (Table 5). Exports of groundnut cake dropped even faster. Their average of US$7 million in 1995-1999 was 69 percent lower than in 1985-1994 and 56 percent lower than the extrapolated trend value (Table 5). Senegal is facing a great deal of competition in this market. Its groundnut oil competes in world markets with vegetable-based oils, sectors of which, unlike in Senegal, have been subsidized. The liberalization of imports and prices of vegetable oils in 1995 in Senegal did not favour domestic production. Indeed, despite the surtax of 44 percent on imported vegetable oils in 1998, their prices are still lower than those of groundnut oils, resulting in a rise in such imports. The tax revenue provided by this surtax, complemented by the Stabex instrument of the Lomé Convention, contributed indirectly to support producer prices at the level of CFAF145/kg, while the world price was CFAF115/kg. 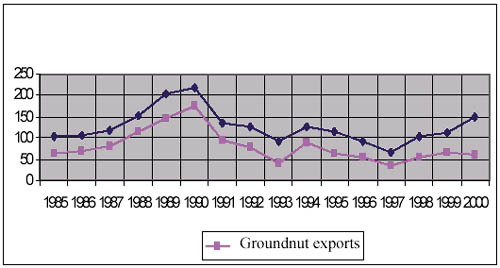 As a result, groundnut exports rose in 1998/1999. Production is likely to drop with the structural adjustment measures set to start in the 2002/2003 crop season. The producer price has been set at CFAF 120 in 2002/2003 in line with developments in the world market prices and in a context of tight access to credit and increased price uncertainties. It is anticipated that many small farmers will experience difficulties in selling their output this year and may have no other choice but to sell output at around CFAF60-70 in many rural areas (Frasques, 2001). Another difficulty Senegal faces is its dependence on the EU market and related changing import rules. Historically, the EU has accounted for the bulk of the sectors export opportunities: 93 percent of groundnut oil and 97 percent of groundnut meal in 2000 (Oil World, 2001). Cotton is the countrys second most important agricultural export item, accounting for around 25 percent of total agricultural exports and supporting about 44 808 small cotton farmers (2000/2001 season). The cotton sector has been fully controlled by the state-owned SODEFITEX, which remained the main processing unit until 2001. The sector is recovering from difficulties experienced in 1998-2000 resulting in a 71 percent drop to 11 000 tonnes in cotton seed production and quality with negative financial impacts on the industry (especially SODEFITEX whose financial deficit deteriorated to CFAF4.7 billion as of December 2001 with CFAF640 million in debts). The industry has shown evidence of hardship in the sector where many small cotton operators are in severe financial distress. Eighty percent of cotton lint produced is exported to the world market where the country competes with large exporters such as the United States and Australia as well as regional exporters such as Mali, Burkina Faso and Côte dIvoire. But since the liberalization of the seed sector and the elimination of support for fertilizers and agricultural raw materials in 1984, producers have preferred selling in parallel markets (at subregional level sometimes), where they benefit from better prices. Despite stronger incentives (credit to producers and guaranteed producer prices), SODEFITEX is facing problems, and its production capacity is underutilized. Furthermore, the 50 percent devaluation of the CFA franc did not stimulate exports because most inputs are imported and their import prices doubled. However, the effects of the surtax of 48 percent on imported cotton lint imposed in 1993 have not yet been fully felt. The sector has seen increased competition since liberalization with the entry of a new private operator (COTONSEN) domestically and capacity upgrading in the WAEMU regional market. COTOSEN has been engaged in the production of irrigated cotton in the Senegal River Valley since 1995, which could prove to become one of the best alternatives to rain-fed cultivation. SODEFITEX has adopted a similar plan to give a boost to sector competitiveness. Because of the situation outlined above, production of cotton lint has declined since 1991, and exports have been on a falling trend since 1985. However, their average value of US$20 million in 1995-1999 was 30 percent higher than in 1990-1994, though 24 percent lower than the extrapolated trend value (Table 5). The improvement was mainly due to favourable world prices. The sector has also remained under stress in the context of record price drops in world cotton markets. The portfolio of horticultural products includes a wide range of exportables concentrated on a few leading products exported either fresh or refrigerated, namely green beans, tomatoes mangoes and watermelon. Other products are exported periodically and in small quantities (okra, flowers). The EU represents the principal destination for Senegalese horticultural products. Other clients include Saudi Arabia, Poland, Switzerland as well as countries in the WAEMU region. These emerging opportunities have started to turn the sector into one of the most dynamic export-led activities after the liberalization process and the 1994 CFA franc devaluation effect. The sector is essentially in private hands. There were about 22 registered exporters in 1999 working with two registered producer and exporter groups (SEPAS, ONAPES) who use relatively few imported inputs to meet everchanging food regulations and consumer concerns in foreign markets. The sector has benefited from several initiatives to strengthen capacities since 1998 in order to meet these demands. Investments have been made to raise product quality and to help meet the various regulations as regards food safety and quality, and various technical norms and sanitary standards in foreign markets (labelling, packaging, geographic indication, etc.). At the end of 1994, the Government eliminated import licensing for onions, bananas and potatoes, and liberalized most horticultural product markets as well as those for inputs (particularly seeds, fertilizers and pesticides). The liberalization of the sector has resulted in increased competition in the domestic market with many smallholdings known to experience difficulties. Imports are still relatively high compared with exports. The average value of exports of US$8.2 million in 1995-1998 was 22 percent higher than in 1990-1994 but 268 percent higher than the extrapolated trend value. The import surges in the potatoes and onions sectors from European producers are known to cause the closing down of many small farms as well as raising concerns about their negative effect on the countrys balance of payments. However, the Government has not yet resorted to any safeguard clause to reduce these effects because of concerns over possible implications for the cost of food for the Senegalese whose dietary habits include large quantities of onions, potatoes and tomatoes daily. Technical as well as financial assistance is needed to assess the possible injury of the ongoing liberalization measures on these sensitive sectors to the poor. Hides and skins are co-products of slaughtering activities which occur in the livestock sector. The liberalization of the sector as well as the elimination of the monopoly situation of SERAS has provided opportunities for private traders whose number has been increasing since 1987. Sector output is demand-driven and is largely exported to meet a growing demand abroad, especially in the EU. Prices have risen gradually to reach about CFAF1000-1500 per sheep skin in 2002. The average export value of US$4.2 million in 1995-2000 was 38 percent higher than in 1990-1994 and correspondingly higher than the extrapolated trend value (Table 5). Further economic analysis of the sector has been hampered by the unavailability of data, which is illustrative of the lack of attention to developments in this area. Food exports represent more than 60 percent of total agricultural exports and, as already noted, are dominated by groundnut products. Therefore, the evolution of food exports is broadly similar to that of total exports as described above. 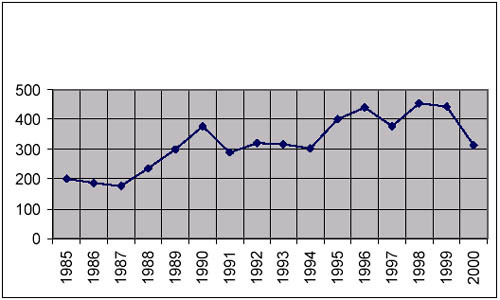 Total food imports were on a broadly flat trend during 1985-1994 (Figure 3), much as were total food exports (Figure 4). In 1995-2000, they were 29 percent lower than in 1990-1994 and roughly as much below the extrapolated trend value (Table 6). Food imports accounted for almost 70 percent of total agricultural imports in 2000, averaging 72 percent in 1985-2000. Five product or product groups accounted for around 74 percent of the total: cereals (rice and wheat; 46 percent); dairy products (8 percent); refined sugar (2 percent), vegetable oils (oil of colza, oil of soybean; 19 percent); and fruit and vegetables (9 percent). Total food imports rose by 90 percent from 1985 to 1990, from US$199 million to US$322 million. After a decrease of 23 percent in 1990-1991, they were relatively stable in 1991-1994, averaging US$308 million. Their average value in 1995-2000 (US$404 million) was 50 percent higher than in 1985-1994 (Table 6). Over the entire period 1985-2000, total net food imports increased almost continuously, worsening the situation of Senegal as a net food importer. Average net imports of US$342 million in 1995-1998 were 87 percent higher than in 1990-1994 and 7 percent higher than the extrapolated trend value (Table 6). Figures 3 and 4 show the evolution of food exports and imports to highlight the higher plateau of the food import bills as well as the valley shape registered in food export performance. Figure 3. Senegal: Food imports (US$ million), 1985-2000. Figure 4. Senegal: Food exports (US$ million), 1985-2000. The rest of this subsection will review the trade patterns of the principal agricultural import items: cereals (particularly rice), sugar and dairy products. Imports of cereals, essentially composed of rice and wheat, accounted for about 54 percent of total agricultural imports and 70 percent of food imports in 1985-2000, with an annual value ranging from US$71 million to US$218 million. Despite the CFA franc devaluation in 1994, the tonnage imported rose in 1995 by 21 percent, to satisfy increasing population needs, and by a further 11 percent in 1996. It then fell by 22 percent in 1997 and rose again in 1998, by 42 percent. This evolution is linked essentially to rice imports, which averaged 38 percent of cereal imports in 1985-2000, followed by wheat (14 percent). The sector has faced difficulties stemming from subsidized wheat flour of EU origin and smuggling from Gambia and Mauritania. Although rice is a staple food, domestic production covers only one-third of consumption requirements. There has been a progressive liberalization of the sector since the mid-1980s. Despite the devaluation of the CFA franc in 1994, these measures did not favour domestic production, which has not increased substantially since the early 1980s. Imports, however, have increased in value and quantity since the 1970s and reached 440 000 tonnes in 1995, despite the devaluation. At US$137 million, average rice imports were 85 percent higher than in 1985-1994 and 68 percent higher than the extrapolated trend value. Similarly, the average tonnage imported (520 000 tonnes) was 43 percent higher than in 1985-1994 and 32 percent higher than the extrapolated trend amount (Table 7). To limit imports, the Government introduced a surtax of 20 percent on imported rice, as explained above. This measure has not yet produced the expected effect on the competitiveness of local production. Domestic producers face high costs of production in a very competitive market, and in the long term, this sector is unlikely to survive without some protection from imports. b Prices and tonnages are expressed in terms of raw sugar (or of wheat) equivalent. The CET under the WAEMU scheme has been adjusted downward to 12.5 percent since 1 January 2000 from 15.7 percent. However, the introduction of an additional 15 percent surcharge (TCI) is under consideration to adequately take into account several unfair pricing behaviours ongoing in world markets, where both the EU and the United States subsidize rice exports. The high level of rice prices should also be compared with the declining and uncertain domestic purchasing power of families to be examined in a moment. Consideration for the well-being of the poor by keeping the cost of rice-based foods within an acceptable range has prevented the Government from initiating any further safeguard measures to protect its domestic rice producers. Another kind of difficulty experienced in the sector is the unfair pricing behaviour that occurs in the rice market chain. It is reported that some large rice importers can often manage to cheat when filing their customs forms for valuations so as to avoid or reduce the level of customs surcharges applied to the landed c.i.f. rice prices. These kinds of practices, if unchecked, pose a threat to the survival of many smallholders struggling to improve domestic rice output. The Sugar Company of Senegal, a private company, has a monopoly of trade in sugar. Despite the prevalence of a high and variable surtax (TCI) since 1995, sugar imports have continued to increase in value as well as in volume, as they did (to a lesser extent) in earlier years. This trend has been reversed in the last three years. Their average value of US$23 million in 1995-2000 was 175 percent higher than in 1985-1994 and 7 percent higher than the extrapolated trend value. In terms of quantity, they increased equally as much as the previous period by 174 percent and 13 percent, respectively (Table 7). The world sugar market has been saturated in the last five years with a depressing impact on the world sugar price. Sugar is the only product in the food sector where the TCI established within the framework of the WAEMU framework has remained in force. The sector has benefited from some investments in recent years to augment domestic production capacity in the Senegal River valley. These forces have worked to impact negatively on sugar import trends. Local production of dairy products satisfies only 32 percent of domestic demand. Liberalization of the sector has left imports in the hands of the private sector, with accessible consumer prices and a large variety of products. This dynamism has not eliminated the risk of producing low-quality products, sometimes not in conformity with international standards owing to the lack of appropriate control at the frontier. Faced with increased competition, Nestlé and SOCA, the largest two milk processors in the country, are now bound for restructuring. During 1985-1990, imports of dairy products were on an upward trend, and their average value of US$35 million in 1995-2000 was 14 percent lower than in 1990-1994 and 49 percent lower than the extrapolated registered trend value (Table 7). As can be noted also, the cost of importing dairy products has not diminished significantly with the liberalization. It has averaged around CFAF25 billion, and there is no sign that this situation will change soon to increase domestic consumption. Per capita milk use (equivalent liter) in Senegal stood at only 30 litres, which is a number well below the FAO recommended level of 91 litre/head (Broutin and Oumar, 2000). In summary, the ratio of food imports to agricultural exports rose almost constantly between 1985 and 1997 but dropped in the 1997-2000 period. Food imports were on average four times as much as agricultural exports in 1995-1997, which were 87 percent more than in 1990-1994 and 111 percent more than the extrapolated trend ratio. This provides some evidence of a worsening situation in the countrys agricultural trade balance, particularly in 1995-1997. However, it also worth noting some signs of recovery with food import numbers heading downward after 1997 (Figure 3). In Senegal, the monitoring of the food balance and its prospects has remained a top concern. Table 8 shows the evolution of production, import and consumption including the level of food dependency in the country during 1992-2000. Cereals production, which consists essentially of rice, millet and sorghum, has stagnated at about 800 000 tonnes annually over the last eight years, falling short of the food requirements of the countrys population. This poor performance has forced a resort to massive food imports. The countrys food imports consist of two components, namely, a commercial source (discussed earlier) and food aid. The administration and operation of noncommercial imports is the responsibility of Senegal Commissariate for Food Security and the resident office of the World Food Program (WFP). However, with the announcement of market liberalization in these countries, falling global grain stocks, and shrinking food aid budgets, food aid availabilities have declined tremendously at the expense of many vulnerable recipients. Senegal is no exception to the shocking experiences this new reality is bringing about. Food aid shipments received in the country have significantly dropped since 1992 to an alarming level of about 4 000 tonnes in 2000. Food aid has never been so low. This simply means that food aid is no longer a relatively free and cheap good, since commodity aid must be purchased from the open market. This highlights the weakening ability of the Commissariate of Food Security to intervene in the case of a food emergency. The Agency lacks the necessary resources to maintain its operational instruments, including adequate levels of food stocks. Despite the increase in food availability as measured by production plus imports, there is evidence of deterioration in the nutritional situation of the country at the individual as well as the household levels for 1980-1999 (Table 9), a period characterized by further liberalization. Liberalization has not significantly improved the national dietary habits which have remained too skewed in favour of the consumption of grain-based foods, and particularly rice. As a result, the Government has been faced with a consistent growth trend in rice imports since the liberalization of the rice market in 1986. The country imported on average 502 000 tonnes over the period 1995-2000, which is 40 percent higher than the level recorded in the pre-WTO period (1985-1994). Source: FAOSTAT. aCereals supply excluding beer. Under the liberalization scheme, producer and retail prices of cereals (rice, wheat, millet, sorghum) have been liberalized (in 1986 for rice, in 1989 for millet and sorghum). Despite these market reforms, the price of imported rice has remained high in Senegal. The price of rice mostly of Asian origin (Thailand, Viet Nam) has increased 30 percent on the average over the post-WTO period to US$263 per tonne compared with the level in 1985-1994, suggesting an increase in food cost. The liberalization of cereal markets has not yet resulted in any increased accessibility to food, especially cereals-based foods for the poor. This conclusion is supported from further comparative assessment of the cost of the national cereal bowl. There is evidence that the real purchasing power of the poor as measured by the real minimum wage level has been dropping - down 20 points to 52 over the period 1992-2000 (Figure 5). It evolved in nominal terms between CFAF152 (July 1982) and CFAF209 (December 2000) to CFAF196 per hour on average during 1992-2000. Assuming 40 hours per week, the minimum nominal purchasing power of a head (worker) of an urban working family could be estimated at CFAF1 568 per day. Figure 5. Senegal: Real minimum wages (1980 = 100), July 1982-2000. The cost of two of the most popular meals, Daxin and Cere ketiax, can be estimated and compared with real purchasing power. The former is a rice-based staple food representative of the most popular food made of imported rice. The latter is based on local cereals such as millet. These preparations are recommended for serving at the same time of the day: lunch or dinner. Costs are estimated for servings for four or five people, a realistic assumption for the average size of a middle class Senegalese family with a regular source of income. As computed, the rice-based food and millet-based meal cost CFAF1 055 and CFAF835, respectively. Thus, rice and millet account for 11 percent and 36 percent of the cost of these meals, respectively. Though millet has retained a price advantage compared with rice, rice has become the most preferred staple food in Senegal because it is easy to prepare when compared with millet. Compared with the cost of serving one millet-based meal and one rice-based meal a day, food could account for at least 67 percent to 53 percent of a familys daily purchasing power, respectively. Daily income has clearly fallen to levels too low to cover the most fundamental basic need, especially the food for feeding adequately an urban household. As for the purchasing power in rural areas as measured by the ratio of price of the local rural-grown agricultural products (millet, sorghum, rice, etc.) to that of selected tradables (groundnuts, cotton), the evidence points to the conclusion reached earlier. The liberalization as registered so far has not yet favoured the producers of domestic cereal producers (millet, rice) relative to those producing the principal cash crops (cotton, groundnut; see Table 10). Over the period 1985-2000, Senegal registered a 40 percent deterioration in its terms of trade, which is indicative of the difficulties experienced in the country to meet its food bills. Note: CPI type I is the consumer price index for a Senegalese household type (BCEAO). In sum, there is sufficient evidence to conclude that the real income of the poor has not been sufficient to cover the cost of the food they need to ensure food security during the period 1995-2000. In assessing the current negotiating proposals and their impact on agricultural trade and food security from the perspective of Senegal, there are two kinds of questions to ask: (1) Is there any issue, scheme or concept contemplated on the agenda, which, if implemented by WTO members, has beneficial consequences for Senegal or might harm its development interests? (2) Is the country prepared to take full advantage of the possible trading opportunities or to overcome new forms of barriers to trade ahead? For the group of developing countries in general and the LDCs, including Senegal in particular, increased access to the markets of the developed countries has not been fulfilled. Yet the economy of Senegal is one of the most open as its trade figures have shown. The country is very dependent on trade flows with a limited number of industrial countries, especially the EU (essentially France), the United States and Japan. Senegal is also very dependent on a limited number of primary commodities, namely groundnut, cotton, fruits and vegetables, skins and hides, and fish, for which it still faces barriers when exporting in primary or processed forms. (1) in the continuation of the current terms of the EU/ACP preferential arrangements for another five to ten years with due account of a derogation from MFN principle; in taking advantage of this possible transition period to gain further in competitiveness, to diversify its export markets, especially in expanding regional trade, to diversify its production base while improving the quality of its products, to secure appropriate ways of funding its agricultural development programmes from either domestic resources or foreign aid; and to ensure that these programmes are addressed under the SDT provision. (5) in re-assessing the effectiveness of available WAEMU border instruments in relation to bound tariffs levels agreed upon in WTO tariff schedules, e.g. 180 percent for Senegal. Senegal has also welcomed the opportunities expressed in various proposals to reduce to acceptable levels the new forms of trade barriers in place, especially in developed countries, and these are outlined below. The tariffication process and the tariff reductions agreed upon so far have not necessarily made these markets more accessible for every WTO member. Average agricultural tariffs remain higher than industrial tariffs because tariffication resulted in higher tariff protection and increased tariff dispersion, as well as more frequent use of specific and other non-ad valorem rates, which have all become complex for many small open economies such as Senegal (Messerlin et al., 2001). Several non-tariff barriers have limited the export potential of LDCs such as Senegal in penetrating the major consumer markets. These include stringent rules of origin and severe SPS measures which constitute real barriers to several products of Senegal origin, such as groundnuts, fruits and vegetables, and fishery products. Senegal is concerned also with the high frequency of tariff peaks and tariff escalation it faces concerning exports of processed agricultural products which add value to its principal primary products such as groundnuts, cotton, mangoes, cotton, etc. The industrial development of many LDCs such as Senegal will not take off unless something is done about these kinds of unfair practice. Senegal has high hopes in the newly announced commitments made again by the WTO members to reduce effectively the levels of tariff escalation against LDC processed products. The agenda of several developed countries, including the United States and the EU, has sought to reduce agricultural production incentives, which would have the effect of slowing down the development of their agricultural sectors. In contrast, the primary goal of policy reform in Senegal has been the elimination of bias against agriculture with a view to raising agricultural productivity, raising the levels of domestic food production, and diversifying agricultural output and export by promoting new crops and processing primary commodities. It is clear that such goals conflict sharply with the implicit goal of AoA, which is to curb excess agricultural production and exports by eliminating the policy distortions which generate these surpluses. Senegal has expressed interests (1) in extending the implementation period of the SDT provision; (2) in taking advantage of this possible transition period to make appropriate use of the resources made available therein; and (3) in seeking ways to provide appropriate support to its subsistence agriculture so as to ensure food security while preserving rural employment (GOS, 2001). The current support instruments that underpin the agricultural policies of the developed countries increase supplies to the world market and depress the world market prices of several agricultural products of interests to the LDCs. For example, one can mention the negative impact of United States agricultural policy on world agricultural markets including its groundnut and cotton sectors, two highly protected sectors in the United States but of crucial importance to the wellbeing of Senegal. For other commodities, the same policy does not lead to a bad result for fooddeficit low-income countries such as Senegal, which would like to see world rice prices dropping to more affordable levels, thereby reducing their food import bills, especially the cost of the food to the poor. Low world markets prices generally make it more difficult for small agricultural producers in many developing and LDCs such as Senegal to compete internationally and even in their own home markets. The situation of the world cotton and potatoe sectors illustrates this point whereby the prices received by producers are so low that many domestic producers are calling for protection. Ironically, groundnut producers in Senegal have often been advantaged by the relatively low price levels observed in the world vegetable oil markets thanks to an industry scheme which levies import duties on subsidized vegetable oil entering the country and redistributes this money to producers. The status of LDCs has now been granted to more than 40 vulnerable countries mostly belonging to the sub-Saharan African group. So far, this designation has brought few meaningful benefits. The Action Plan agreed at the second UN Conference on the LDCs held in September 1990 contained specific measures in favour of LDCs which have not yet been delivered. The Ministerial Decision of 15 December 1993 on measures in favour of the LDCs (at the end of the UR) stated that MFN concessions concerning the tariff and non-tariff measures affecting the exports of LDC would be treated in an autonomous manner, in advance and without rescheduling. It was also agreed that the Generalized System of Preferences that affects the products of interest to the LDC should be improved by augmenting the scope of eligible products, increasing the tariff concessions and relaxing the rules of origin. LDCs such as Senegal could have benefited from these offers if they were implemented. The country could also have gained from the effective implementation of the agreements made at the time when the WTO was established. The developed member countries agreed in Marrakesh to open up their markets to more than 70 percent of the products of interests to the LDC free of duty under various special preferential arrangements designed specifically to assist LDCs (GOS, 2001). In addition to the special and differential treatment supposedly derived fully from ACP country status with the EU, Senegal could have taken further advantage of the non-reciprocal benefits offered by other countries to improve its trade balance and structure. There will be a long way to go before net food-importing countries such as Senegal see some short-term fruits of the operational aspects of the EU newly announced EBA initiative. The country, and especially its infant textile industry, could have benefited from the various support measures proposed in the WTO Action Plan for the LDCs as agreed by all members at the first ministerial conference of WTO held in December 1996 in Singapore. The same types of commitments have been renewed at several other subsequent high-level trade consultations and talks without delivering sufficient tangible resources to address the special needs of the poor. From Senegals perspective, the existing AoA does not fully reflect the non-trade concerns of the poor. A special committee to monitor the WTO talks is now in place in Senegal. This arrangement offers the best framework within which to hold open and national debates on each item of the ongoing WTO talks. It is helping to reach consensus on items to include in the Development Box as well as in the Food Security Box which is under construction. The committee has produced a few position papers, which have been echoed in this case study and in the positions the country is defending in trade forums. Perhaps the most important of these is the firm call Senegal is making to allow LDCs such as Senegal the flexibility to give internal support to their agricultural sectors with a view to augmenting significantly agricultural productivity and local production capacity to levels which can ensure food security for all of their people as well as raising revenues to reduce rural poverty to acceptable proportion. Despite all the good intentions to provide technical and financial assistance to those in need, committees such as NCTMN in Senegal have remained lacking in human and financial resources. It would make a real difference if such an advisory support group were provided adequate technical as well as financial support to execute their respective missions. It is not surprising that many of the Doha negotiating proposals including that of Senegal insist again on seeing the operational aspects of the Marrakesh Ministerial Decision implemented. In short, Senegal definitely has a high stake in participating actively in the various regional and multilateral trade talks so as to push for a Development Box and a Food Security Box. It is hoped that this platform provides the vehicle to share the real concerns of the various negotiating groups to which it belongs: the interests of developing countries (too large), those of the group of LDCs (which is too narrow) as well as the net food-importing developing countries (a very heterogeneous group). Senegal should better insist on the implementation of the operational aspects of the Marrakesh Decision, the HIPC initiative and those of other LDC trade facilitating schemes. New resources should be made available because of renewed commitments to the Marrakesh Decision, which, if implemented, would be favourable to LDCs such as Senegal. The eligibility of Senegal for LDC status should also open up access to technical as well as financial resources provided under various other special initiatives such as the HIPC debt relief initiative and the WTO-led LDCs support initiative. The country should not lose sight of developing its domestic agricultural production and its food industry in the longer run. The country could give special attention to developing agricultural outputs in support of those food sectors which have proven potential to contribute significantly to its food security and poverty reduction goals. Experiences have shown that such potentials and opportunities exist and have not been fully exploited in selected areas of the economy. Priority could be given to the development of the production of local cereals such as millet, rice and sorghum, which have been neglected in the implementation of the countrys past agricultural policies (Broutin and Sokana, 1999). This can help increase the countrys cereal production, augment the industrial output of related manufacturing units, elaborate more processed and high-value-added products for the domestic and regional markets (WAEMU) with possibilities of generating new jobs and revenues in the most disadvantaged areas (rural economies) and for the poor including women. The government could consider similar schemes for the development of the fruits and vegetables (green beans, potatoes, onions) sector, as well as the local milk-producing sector. Improving trade facilities in these areas can make a significant contribution to food security. Regarding export subsidies, Senegal does not have the option of providing nonexempt export subsidies, but as an LDC, it could grant subsidies to reduce the costs of domestic marketing and international freight, and that could prove very helpful in view of its high internal transport and marketing costs, particularly for fruit and vegetables, where continuation of this exemption would be particularly important. The export-led sectors of the country currently do not have any control of the freight and shipping cost conditions of their respective products to destination markets such as the EU and Asia. They have been severely handicapped by the decay of the transport services sectors and unfair pricing practices by the major air carriers such as Air France and DHL. The government should bring under one roof the agencies supposed to contribute to the strategic innovation base of the country. This strategy could start with the consolidation and integration of the financial and human resources currently available at ISRA (and ITA) with a view to delivering high-value research, educational and technology products designed specifically to meet the needs of local as well as foreign clients in various strategic areas of interest to the nations agricultural and industrial base. The country can use such an agricultural technology complex to execute various missions: (1) To ensure the development of a seed bed and the delivery of high-yielding seed varieties, which are needed in augmenting productivity in various agricultural sectors: groundnuts, cotton, hides and skins, rice, milk, millet, corn; (2) to work closely with the Senegalese Association for Normalization to initiate the necessary actions to upgrade the capacity of the country in the new areas related to the various UR agreements; (3) to serve as an interface in contracting for the transfer of specific technologies in the north and those of strategic value to augmenting agricultural productivity; and (4) to provide the technical assistance needed to make the domestic food chain more efficient, thereby contributing to the competitiveness of sectors such as cotton, groundnuts, fruits and vegetables, and animal and marine products. Broutin, C. (Gret) & Sokona, K. (Enda-graf). 1999. Innovations pour la promotion des céréales locales: reconquérir les marchés urbains. Senegal. Broutin, C. (Gret) & Diokhane O. (Réseau TPA). 2000. La filière «Lait et produits laitiers». Réseau Technologie et Partenariat en Agroalimentaire, Dakar, July. Dean, J.M., Desai, S. & Riedel, J. 1994. Trade policy reform in developing countries since 1985. Washington, DC, The World Bank. Frasques, Les agriculteurs répondent à Abdoul Fall «Léconomie libérale, ça tue le paysan!», 22 février, 2001. Dakar, Senegal. Government of Senegal. 2001. Senegal position paper. Presented at the 3rd UN LDC Conference. Brussels. 14-20 May. Harrold, P. 1995. The impacts of the Uruguay Round on Africa. Washington, DC, The World Bank. IMF. 2001. IMF Country Report No. 01/186 Corrected. Washington, DC, IMF. Jeune Afrique. No. 2005. 2000. Sénégal, Horizon 2000. Spécial 50 pages. (June 1999); No. 2039. Sénégal/Présidentielles. Les vrais enjeux. Spécial 36 pages. (February). MEFP, Direction de la Planification. 1996. Plan dorientation pour le Développement Economique et Social: 1996-2001 - 9ème Plan: Compétitivité et Développement Humain Durable, Ministère de lEconomie, des Finances et du Plan. Messerlin, A.P. 2001. Measuring the costs of protection in Europe. Washington, DC, Institute for International Economics, September. Oil World. 2001. Oil world annual 2001. Hamburg. SODEFITEX, Renaissance Cotonnière. 2001. La relance à lépreuve de leffondrement des cours. Newsletter No. 02-November. UNDP/World Bank Trade Expansion Program. 1993. The case of Senegal. United Nations Development Program. UNDP/World Bank Trade Expansion Program. 1992. Senegal: Private sector assessment. Yellow cover. World Bank, Sénégal: Stabilisation, Ajustement Partiel et Stagnation, Rapport No. 11506-SE, 1993. Washington, DC. WTO, 1994. Trade policy review, Senegal. Committee on Agriculture. Geneva, WTO. Study prepared for FAO by Dr Adama Ekberg Coulibaly, International Consultant, FAPRI Afrique Bureau. The author acknowledges the assistance of the following: Koffi Yao, Resident Representative, International Monetary Fund (IMF); Colonel Alioune Seck and Mamina Ndiaye, Director, Senegal Commissariat for Food Security (SCFS) and Chief, Bureau of Studies and Information respectively; Mr Alioune Gassama, Mr Jean Cuzon, Mr Amadou Diouf, Director, Technical Advisor, Chief Division of Statistics and Forecasts, Ministry of Agriculture and Livestock, respectively; Mr Diené Ndiobo, Coordinator, Senegal National Committee for Trade and Multilateral Negotiations (SCTMN), Madame Diarra Dioma Diagne (Secretary at FAO, Dakar); Samba Kanoute, Mbaye Fall, Ousmane Faye of the Directorate for Forecasts and Statistics, Senegal Ministry of Economy and Finance. The views expressed in this document are those of the author and do not necessarily reflect the views of the Government of Senegal. Jeune Afrique no. 2039, Sénégal, Spécial 36 pages. Before the UR, ODCs were not listed in schedules. According to the Understanding on the Interpretation of Article II:1(b) GATT 1994, ODCs levied on bound tariff items should be listed in Schedules of concessions and should reflect actually applied rates on 15 April 1994. Contracting parties (WTO members) can challenge the ODC rates during a three-year period after the entry into force of the WTO Agreement. This does not seem to be a problem for Senegal now as more than three years have passed since it acceded to WTO. The poverty line is set at CFAF143 080/year/adult equivalent, i.e. CFAF395/ day/adult.